The square and garden were created and named in memory of a French resistance Fighter and Paris councillor, yet two fig trees are planted where there was once another back in the 1600s when the garden was first laid out. 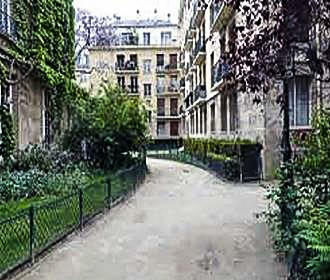 Sometimes known as the Jardin Roger Priou Valjean, you will find on the Plaque at the entrance gate that has been produced by the Mayor of Paris, the name reads Square Roger-Priou-Valjean. This garden and square was named after the French Resistance Fighter and Paris Councillor Roger Priou Valjean, and is located by the corner of Rue du Figuier and the Rue du Fauconnier, which is where you will find two fig trees. However, these recall the time when there was once one large fig tree, yet this was destroyed, as it hindered the passage of the carriage that used to transport Marguerite de Valois, or Queen Margot as she was known. And as well as these fig trees, you can see almost a wild style of vegetation with other types of trees and bushes including plum, lime and plane trees plus a basic childrens playground that includes a slide and some park benches to relax on. You will find the Square Roger-Priou-Valjean Garden in Paris open from 8am during the weekdays and 9am at weekends, however, the closing times vary dependent upon the time of year, with the earliest being at 5pm in the winter and later closing of up to 8.30pm from the end of May to the end of August. It shows there is access for the disabled and this square in Paris has been classed as an eco green space plus there is a small basic childrens playground, yet we would like to point out that unfortunately dogs are not allowed. When it comes to accessing this garden in Paris, it is situated in the 4th Arrondissement and the entrance is located on the corner by the Rue du Figuier and the Rue du Fauconnier, yet quite close to the River Seine, the nearest Metro station is the Pont Marie stop via line 7.